MIXED MEDIA Art Set for every age group. 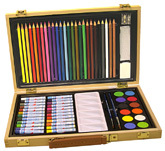 This Art Set offers quality components and portability. Take it with you anywhere, whether studio, classroom, field or home. Makes a GREAT GIFT, too!